Shop curated collections of summer reading titles or create custom collections unique to you. For real choice, get your students involved in selecting their own books! 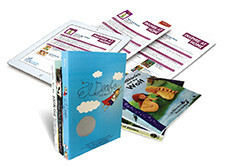 Discover ready-to-use collections of high-interest summer reading titles, available by reading level, genre or Spanish for grades K-8. Choose from thousands of summer reading books to create your own customized collections—or let our literacy experts suggest the best titles for your students. To stop summer slide, engaged reading is key. In fact, research shows that engaged summer reading has the power to combat summer learning loss. When kids read books they WANT to read over summer vacation, they read more—eliminating (and sometimes even reversing) summer slide in the process. With the Booksource Summer Reading solution, it’s easy to engage students. Our exciting summer reading titles and collections have been hand-selected to foster interest, engagement and achievement. HAVE QUESTIONS OR NEED HELP WITH YOUR SUMMER READING SOLUTION? Call us at 800.444.0435 to talk with one of our Literacy Accounts Manager or visit our Educator Help Center for answers to frequently asked questions and tips for an effective summer reading solution.